Yes, a Jedis strength flows from the Force. But beware of the dark side. Anger, fear, aggression; the dark side of the Force are they. Easily they flow, quick to join you in a fight. If once you start down the dark path, forever will it dominate your destiny, consume you it will, as it did Obi-Wans apprentice. New Updates! (4/19/2019) We've been working really hard on completing our membership system so you can submit quotes and keep track of them. Once this is complete in the coming weeks there will be a lot more quotes by Yoda and other authors. We've also changed the sorting on the site so you now see the latest Yoda quotes first. 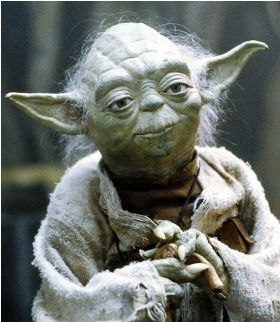 Our goal is to have the best Yoda quotes on the web!